This article will undoubtedly anger some Christians. And, in a way, that will only affirm my motives for writing it. Anger and hate seem to permeate any discussion about the historical Jesus, especially from those who claim to believe in a person who spoke mainly about love and kindness. But there may be a reason for this, as I hope this article will reveal. Belief in Jesus, Christianity, is more than a philosophy. It is the belief that a deity -- something non-human -- incarnated as a human man some two thousand years ago, was killed by a political and religious power, and then re-animated his life. So powerful is the belief in the resurrection of Jesus that it all to frequently obscures the teachings of this remarkable person. What most people know about Jesus comes from the Bible. This literary work contains his biography and teachings, as told by writers who, as many believe, lived in the first couple of centuries following Jesus' life. No place in the Bible is Jesus ever quoted as saying he was a deity. No place in the Bible does Jesus instruct his deciples that he should be worshipped as a god. In fact, the repeated message of Jesus was that he, and all of us, are part of the family or "kingdom" of the "Father" -- the One God who created everything -- and that this kingdom is bound together by selfless love. I was raised as a Catholic and attended a Catholic grade school and high school. I learned morality and compassion from the priests and nuns who taught me. I also learned the scriptures. But it wasn't until I got to college and took courses in Western Civilization that I learned that the Bible, specifically the New Testament, was edited by a group of politically motivated clerics in the 4th Century acting as the famous Council of Nicea. Naturally, I was curious what they "edited" out of the Bible, and that was an eye-opener. In the well known film, Time Machine, the main character is amused as he views the endless changes of costume that cover a store mannequin and mark the passage of time in a shop window. If we were to travel backward in time, while looking at a Christian church, we would see an equally interesting view of the crucifix. At some point, near the 4th Century, we would see the wooden cross fall away leaving the image of a man, standing with his arms outstretched. The early Christians did not dwell on the death of Jesus, but rather embraced his teaching about life and love. In 140 AD, a wealthy shipping magnate and a Bishop, Marcion, arrived in Rome. He compiled a list of books in circulation at the time describing the life and teachings of Jesus. Most treated Jesus as an inspired teacher who was devoted to promoting worship of the One God, who he called "Our Father." Oddly, none of the books on his list passed the later censorship by the Councin of Nicea and made it into the New Testament. He was subsequently excommunicated in 144 AD. "I did not succumb to them as they planned... and I did not die in reality but in appearance, lest I be put to shame by them... For my death which they think happened, happened to them in their error and blindness, since they nailed their man unto their death... It was another, their father, who drank the gall and vinegar; it was not I. They struck me with a reed; it was another, Simon, who bore the cross on his shoulder. It was another upon whom they placed the crown of thorns... and I was laughing at their ignorance." Mani was born in Baghdad in 214 AD to a family related to Persian royalty. As a youth, Mani was introduced to a gnostic cult emphasizing celebacy and ascetism who wore white robes and practiced baptism. In 240 AD Mani announced his own teachings, based on his rigorous study of scripture. He was known for his ability to lead and perform exorcisms. His followers called him "the new Jesus" and he was also known as the "pilot" and "helmsman." Mani produced many books that he claimed revealed the secrets that Jesus had only hinted at. He claimed he had received the same enlightenment as Jesus, Zarathustra, Buddha, etc., from the same source. 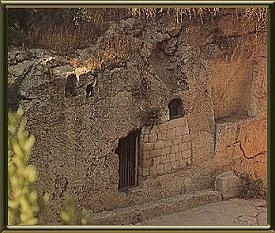 Mani exposed the doctrine of reincarnation and resurrection, believing that Jesus was an "enlightened" man. He insisted in an initiate class - an "illuminated elect" - and referred to Jesus as the "son of wisdom" - a phrase common to Freemasonry. 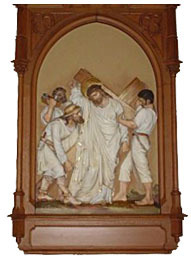 He said Jesus was mortal and that he did not die on the cross but rather was replaced by a substitute, supposedly again referring to Simon of Cyrene. In 276 AD, by order of the King, Mani was imprisoned, flayed, skinned and finally decapitated so that he could never claim to ressurect. This made him a martyr and his followers grew. I won't bore the reader with lists of gospels that ended up being burned, but suffice it to say that most of the works ignored the idea that Jesus was a deity and focused on his message of worship of the Father and of selfless human love towards ones neighbors. Arius was a presbyter in Alexandria in 318 AD. He disputed the deity of Jesus and said he was an inspired teacher. Arius believed a god would not lower himself to human incarnation as this was a sign of a weak and timid god. Arianism was officially condemned in 325 AD at the Council of Nicea but Constantine was always sympathetic to this belief, especially in his later years. Arianism was the most popular form of Christianity by 360 AD and had largely displaced Roman Christianity. Although it was officially condemned again in 381 AD it thrived when the Merovingians rose to power in the 5th Century. Virtually every bishopric in Christendom was Arian. The most fervent Arians were the Goths who had been converted from paganism in the 4th century. If early Merovingians, prior to Clovis, were receptive to Christianity it would have been Arianism since this was the belief of their surrounding neighbors, such as the Suevi, Lombards, Alans, Vandals, Burgundians, Ostrogoths and the Visigoths. Under the latter, Arianism was the dominant form of Christianity in South France, Spain and from the Pyrenees Mountains to Gaul. I will end here. The point I want to make is this: the idea that it was necessary for Jesus to have resurrected, to have risen from the dead, is an idea that was initially unimportant. He was not the focus of worship -- the "Father" God was. That concept, that we are all part of the Creator's family, and the necessity for loving others (i.e. especially those with whom you disagree) was what Jesus taught. That was his "mission" and raison d'etre. About 30 years ago (1980) some workers in an industrial area of Jerusalem, called Talpiyot [Right], discovered a cave containing 10 stone boxes. The discovery was quickly reported to the Israeli Antiquity Authority who excavated the cave and retrieved the boxes for safe keeping and further examination at the facility in Beit Shemesh. The boxes were familiar to archaeologists, who recognized them as "ossuaries." For about a one hundred year period, two thousand years ago, it was the custom in Israel to wrap a dead person in a cloth that was soaked in scented oils and spices. The wrapped body was then placed in a dark place on a stone shelf called a loculus where it was allowed to decompose for about a year. Following decomposition, the remaining bones were transferred to a wooden or stone box, called an ossuary, which was usually inscribed with the persons name and then buried with other family members. The typical ossuary was about 20 x 10 x 12 inches -- the longest length accommodating the longest human bone, the femur. The ossuaries of Talpiyot remained under the scutiny of archaeologist Amos Kloner, who eventually translated the ancient Aramaic writing on the boxes. About ten years ago, Kloner shocked the world by announcing that one of the ossuaries appeared to be inscribed with the name of James, and suggested that this was the brother of Jesus. The public didn't react much to this news, although some were surprised to learn that Jesus had a brother, and the discovery of the ossuaries faded into obscurity. Now, ten years later, it is being revealed that the other boxes contained inscriptions of "Jesua son of Joseph," "Mary," another "Mary," "Jofa" and "Judah." 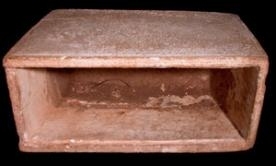 Dating of the boxes indicates that they all fall within the historical era of Jesua, or Jesus. Further DNA testing has already been completed and it is expected to reveal that there is a family relationship showing that Jofa was the brother of Jesus, both Jesus and Jofa were offspring of Mary and that Jesua (Jesus) and Mary (Magdala) had a son, Judah. Of course, no one has the actual DNA of Jesus to compare. And these names, according to historians, were common names of the time. But the chances of all of the names of the family of Jesus being represented on the ossuaries, plus their DNA supported family relationships, are too significant to ignore. Forensic examination of the bones of Jesus should prove to be very interesting, especially if they reveal signs of the crucifixion! It is no surprise to many scholars that Jesus, considered to be a Rabbi, or teacher, would have been married. In fact, according to Judaic experts, it was imperative. "An unmarried man may not be a teacher." (Phipps, The Sexuality of Jesus). "There were those who always walked with the Lord: Mary, his mother and her sister and the Magdalan, the one who was called his companion." "And the companion of the Savior is Mary of Magdala. But [Jesus] loved her more than all the other deciples and used to kiss her on her mouth. The rest of the deciples were offended by it and expressed disapproval. They said to him, 'Why do you love her more than all of us?' The Savior answered and said to them, 'Why do I not love you like her? There is the son of man and there is the son of the son of man. The Lord is the son of man, and the son of the son of man is who is created through the son of man.'" We know little about Mary of Magdala, but some interesting facts have been uncovered suggesting that she was no ordinary woman. Migdal or Migdala was known as the "village of doves." There is archaeological evidence that sacrificial doves were bred there on a large scale. Dove sacrifices were the sacred offerings and symbol of the goddess Astarte and so it is believed that Magdala was a religious center of this cult. Astarte was a popular cult of that region and time. In fact, the Church of the Holy Sepulchre, which is traditionally thought to be the tomb of Jesus prior to his resurrection, was built in 335 AD on the ruins of a Temple of Astarte! The Bible tells us that Mary of Magdala was possessed of "seven demons." The seven demons are thought to refer to her achievement of attaining the seventh and highest level of enlightenment under the Astarte cult. This would have meant that Mary was the equivalent of a high priestess. The fact that this achievement was viewed as a "demon" or sin suggests that she rebuked her worship of Astarte in favor of the "Father," the God described to her by Jesus. This anouncement concerning the ossuaries and DNA evidence is to be made by three time Oscar winning director, John Cameron (Titanic), in conjunction with renowned archaeologist Charles Pellegrino in late February 2007. Cameron is believed to be making a 90 minute documentary about the discovery. Two of the ossuaries, those of Jesus and his wife, Mary of Magdala, are to be flown to New York City to be placed on display and subjected to further scrutiny. The finding, if validated, would not necessarily cast doubt on the fact that Jesus was killed and resurrected, but would invalidate subsequent scriptural stories that he never married and that his body was transported back to heaven on a cloud (i.e. the Ascension). Many people, however, see the mortality of Jesus as stripping him of his deity status and placing him as an inspired teacher or prophet -- the same belief that inspired good people to worship the Father in the early years of Christianity. Will this destroy Christianity? I hope not. The teachings of Jesus about love and worshiping God as a "Father" are enough to sustain morality and humane treatment of one's neighbor but they may be an affront to those that insist that Jesus is God. Many Christians believe that, despite engaging in a life of hate and greed, they can neutralize these acts by the egocentric concept of accepting Jesus as their personal "God" savior. They may have to re-think this approach. Perhaps we will see a new and better Christianity evolve from this -- a Christianity that places importance on being kind to others and practicing selflessness. It's much needed. As Jesus said, "A good tree bears good fruit." Look around at all the so-called Christians who promote war and killing, hate homosexuals and non-Christians... perhaps we need to get back to the precepts of the early Christians and make the Father and Love our centerpiece in life. Christianity has sadly become a religion about Jesus instead of the religion of Jesus. Well, I await the hate mail from all the believers... but doesn't that just prove my point? 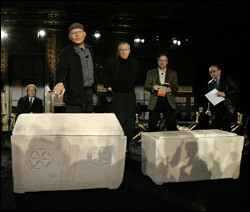 The anticipated announcement was made on February 26, 2007 and the ossuaries of Jesus and Mary of Magdala were displayed to the press [right]. Although the DNA evidence has not yet been released, the media are already skeptical about the announcements and subjecting Cameron to ridicule, claiming this is a publicity stunt done for money. Oddly, none of the criticism is directed towards the scientific or forensic data. Certainly, if this were part of a murder investigation, the circumstantial evidence of the family names, the age of the remains and the DNA establishing a family relationship would seem sufficient to merit a degree of probability to the claim. The media's swift and biased reaction seems very suspect. Well, saw the Discovery Channel special last night. The DNA evidence was not what I expected in that they only tested the bone fragments of Jesus and Mary Magdeline (they say because the other bone fragments were already cleaned from the ossuaries). The maternal mytochondrial DNA was negative, meaning Jesus and Mary Magdeline were not related and so the assumption was that they were in the "family" tomb because they were married. 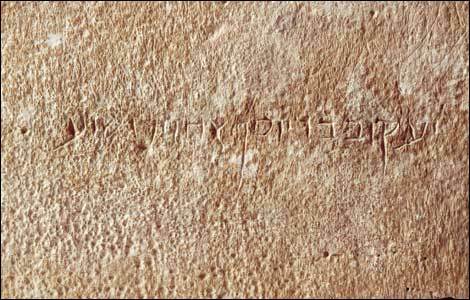 There was also a small ossuary that was inscribed as "Judah, Son of Jesus" which further suggested that they were married. The documentary was very good and convincing. I'm sure in a court of law it would be enough to establish a reasonable case. What I found most interesting was the discussion after, hosted by Ted Koppel. The attacks against the archaeologist and his team were lame and without merit. The other members of the panel were ready to deny the claims based on nothing more than that it was too radical for their established beliefs and that the work was done by an "amateur archaeologist." They really never said anything to contradict the facts. That was odd. I think the most odd thing however is the fact that, the next day after the documentary made its world premier on television, no one is talking about it -- nothing on CNN or any of the news media. I mean wars have been fought and thousands, maybe millions of human lives have been lost because of the belief in Jesus as a deity... and now that there is realistic proof that he was a man people just want to ignore it. It would be great if the fact that Jesus was just a man would be accepted and not cause people to bail out of Christianity but it seems to me that too many people have invested too much in the Jesus-as-God story to ever go back to believing he was a prophet. Anyway, thanks viewzone for publishing the story and the interesting history to go along with it. Hear! Hear! Personally, I think you've hit the nail right on the head. Jesus was just a man. Or, you could say that he was no more a God, or was a God just like the rest of us. We are all the same in my book. When we as humans begin to realize that, then the prejudices and judgment that comes along with those prejudices will melt away and mankind will finally take his place among the Universal Family that we belong to. Thank you for your boldness to question the status quo. Albert Einstein said it the best as far as I'm concerned: "Question everything, especially authority." A very well written article and one that I think will bear scrutiny. Let us hope that the truth is finally published and the human race can move on. The human race has been brainwashed into feeling guilt for our "sins" as it were but really we are trapped in a never ending spiral of emotions which are reinforced by the mainstream media etc. Anyway hope this makes a bit of sense. Yeah. Like I especially like the part where they accuse Cameron of just trying to make money off the idea. Like the church hasn't been making any money all these years by telling people that Jesus was God. Right. I have enjoyed your writing and admire the fact that you have studied much in the area of my interest. I have not done an indepth study on Christ but have read several books over the years on this subject. My beliefs are along the same lines that you have written. Thank you for sharing your knowledge. Yes, I'm glad people are able to cut the crap and see the truth. In a true sense, we are all gods. We are all the sons and daughters of god. And I'm positive that's one of the messages Jesus, the man, the prophet, was trying to get across. It amazes me how skewed everything has become. Not to impose my own beliefs, but I'm glad this is coming to light. You need to check your church history. For instance, Arius did not believe that Jesus was just an inspired teacher. Rather, only the body of Jesus was truly human. His soul (and mind), while not strictly God, were that of God's son, the first created being, by whom God the Father created everything else. On this, check out The Oxford Dictionary of the Christian Church, RPC Hanson's The Search for the Christian Doctrine of God and other standard works. Consider this: if Jesus is God it is impossible for us, as mortals, to attain His spirituality: "Our good works are as filthy rags to God" is a phrase that comes to mind. Conversely, if Jesus were a man, it would mean that it is possible to attain his spirituality. The orthodox insistence that Jesus is God provides, I believe, an escape hatch for self-indulgent Christians. "Yeah, I oughta do what Jesus said, ya know? But he was, like, God! So, open me another beer, Fred". Christianity, at present, is a conspiracy to stunt spiritual maturation. Adult Christians are encouraged--indeed, exhorted--to remain infantile and rely on catechisms, priests, ministers, et cetera. At this late point in human history, don't you think it's time for us to grow up?